I decided to get my yarn and knitting projects organized. My yarn stash was worse than my stitching stash. I had some yarn here and some yarn there. So I got it all together and inventoried on Ravelry. What a great site. 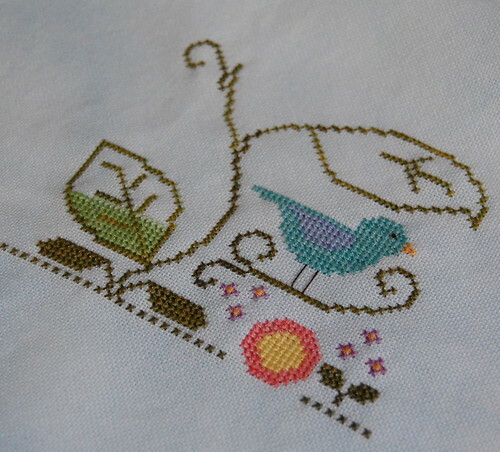 I wish there was something like that for cross stitching. 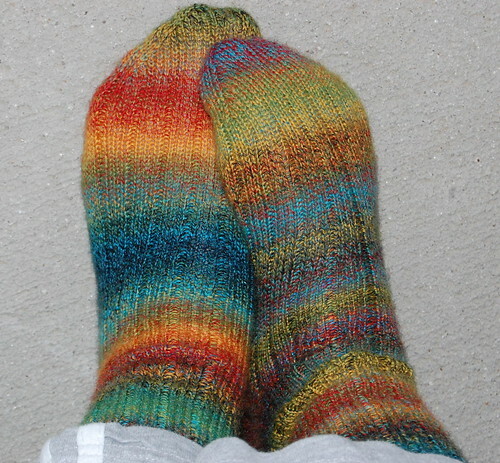 So anyway I decided to finish up a pair of socks that I've been working on since 2005! I finally did it tonight! I got the thread I was needing at my somewhat LNS yesterday. I also got some threads for the new designs coming out. :) Not that I'm excited or anything! :) Well, not much else going on here! Write later! First of all, I haven't stopped by your blog in a while (just reading via Google reader), and I love the changes you've made...especially the header. Looks great. Second, you've been working with some great colors lately. They're so cheerful. 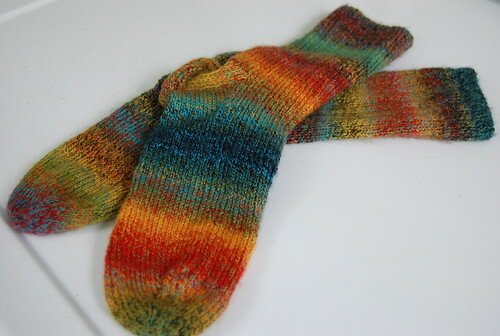 I love the socks and I love hte colors in Joyful Summer. They both look like so much fun! Perfect for this time of year! Beautiful socks--I'm so jealous that you can do that. What a great job! Are they hard to do? Need special stitches? I can do basic knitting, but that's pretty much all. Joyful Summer looks like it's name, joyful--and you aren't the only one excited about the new designs. Aren't they super? Cool socks! I love how the color variations came through. My daughter loves Ravelry. I agree - we cross stitchers need something like that. Joyful Summer is looking good. Beautiful socks! And a great start! your blog its very beautiful and i'm creasy about LHN and CC same you! do you write french...i'm a canadienne from quebec and my english it's so bad,sorry. What lovely socks. I think putting them on in the morning would lift my spirits because of the happy colors in them. I love the socks! And JS is such a beautiful design!